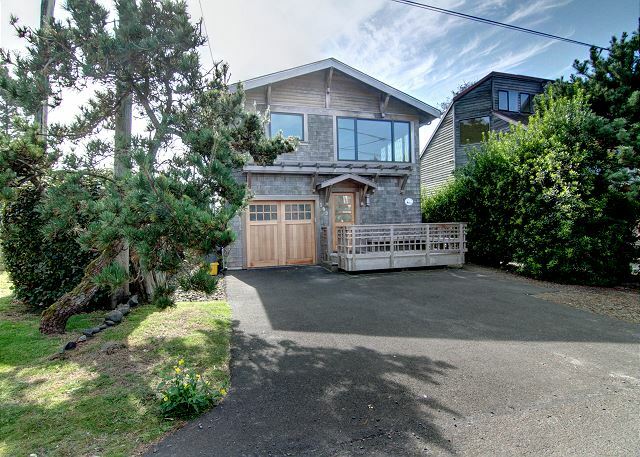 Koblegarde's Beach House is a cozy, multi-level contemporary home tucked into the quiet Tolovana end of Cannon Beach, a short walk to the beach, the Sea Level bakery, and Surfcrest market. Entering the first level, 2 bedrooms, a bathroom, and an ample laundry room conveniently provide spacious privacy for your family. One bedroom, located in the finished garage, provides two Queen sized beds, a T.V. and DVD player. The other bedroom has a King sized bed as well as its own T.V. and DVD player. Both bedrooms flow into the private bathroom and conjoined laundry room from either side. The bathroom has a tiled walk-in shower and the laundry area has a full sized washer and dryer. The upstairs open floor plan invites a relaxing evening in front of the stoned hearth and gas fireplace, while others can either gather around the dining booth, or prepare meals in a well-stocked and roomy kitchen. The spacious island counter also provides additional bar-stool seating. The upstairs bedroom flows off of the dining area and provides a Queen sized bed. 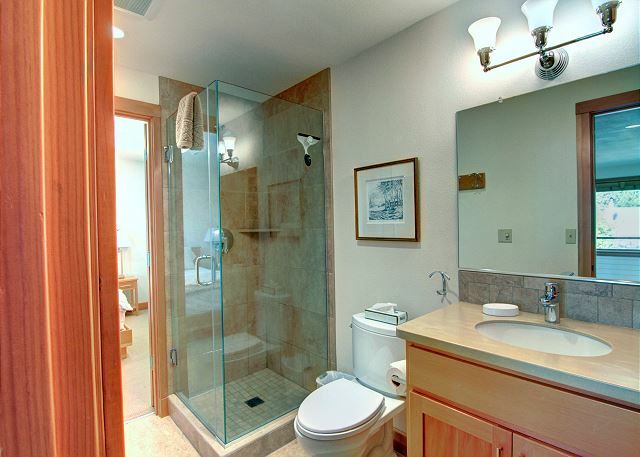 A second bathroom with a tiled and glass walk-in shower is accessible from either the bedroom or the family room. Located on the west side of Hemlock, the beach is only a block away with easy access. You are sure to create special memories while staying at Koblegarde's Beach House. Accommodates 6 maximum; no pets; no smoking; parking for 2 vehicles. 7 night minimum stay during summer months with a Sunday arrival date. Deck Furniture and BBQ's are available from Memorial Day to Labor Day. "The quality of the rental. I appreciate attention to detail and Cannon Beach Property Management has many properties of that go above and beyond. " It was a pleasure having you, come back soon! "the Kitchen is awesome to cook in. The rental has everything you need. You can just get on with relaxing and enjoying you vacation. " "Quiet and convenient location to the beach, coziness." "Love the location! House really well stocked. " "Quality of house and was of the transaction "
"Very nice home with all the amenities we needed! " "Excellent home with very nice amenities. Great location with an easy walk to the beach. Very comfortable and clean. " "Pleasing house. Attractive. Comfortable. Great use of space." "Stayed here for a wedding we were attending, including our daughter + others. Very clean, nice decor. Kitchen had everything you could need. Only downside was the bedroom in the garage and bathroom location. I didn't realize from the pictures/description that one of the BR was actually in the garage. My daughter and her friend said it was fine for them but they either had to share our master bath and walk through the laundry room to get to it, or go upstairs to use the other bathroom. A bit awkward. Otherwise it was a very nice house. No beach view, but just down the street access. " "Great place to stay that is a very short walk to the beach. This was our second time staying at this property and it continued to be great." "The 3rd bedroom is the garage, and the grill is an old rusted Weber charcoal burner, but other than that it was a lovely stay.Good appliances." "When our two boys were young we used to go to Cannon Beach for vacation. This was our first time back with them and their families in over ten years. It was a wonderful time. Great place, short walk to the beach! " "Great house, great location, easy to book & manage. The upstairs had one bedroom & the downstairs had two. Sound didn't carry in the house. We had one baby sleeping upstairs and one downstairs, and they never woke each other up. Kitchen was fully stocked, we were even able to BBQ. Only downfalls were the wire rail around the top of the stairs regarding safety with the babies trying to climb it. We did bring our own baby gates which helped keep them off the stairs. There was also a lot of traffic as this house was on the corner of a busy street. Not just the sounds of cars, but also the traffic of cars driving down the street & stopping in front of the house at the stop sign. Also the downstairs bedroom where the garage is - it would have been nice to have light-blocking curtains like the other rooms. Overall, we were very happy with the rental. It had enough room for two families. Open concept was great for seeing the babies while still being able to cook or play games at the table. A block to the beach with a staircase down to it was perfect for us! " "We stayed in Koblegarde's a few years ago and the inside still looks like it is brand new. The description is accurate and would stay there again." "I just wanted to thank cbpm for the wonderful time we had. I don't normally write reviews but felt I should due to the great job cbpm did in taking care of us. The property we were originally in had a water heater break a few hours before check in but they found us this place to stay in on a very busy sandcastle weekend. It met all our expectations and more. 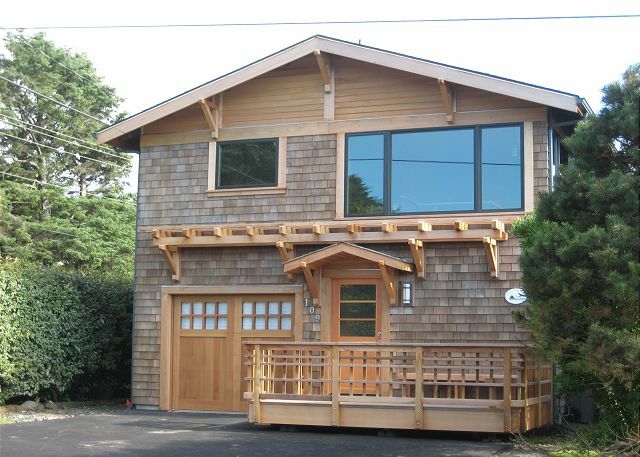 It is in a great location with a short walk to the beach and haystack rock. It was very clean and modern. We have been using cbpm the last 5 years and they have been great. Keep up the great work you guys do and we'll see you in a few months. " Thank you for your understanding during this short notice move. We are happy to hear you had a great time! "What a wonderful time! We're quilters, so we sewed part time, spent time on the beach, enjoyed beautiful Cannon Beach and relaxed in this lovely, well kept home. I've stayed at Cannon Beach Property Management rentals in the past and so enjoy working with them. Friendly, helpful, professional team!" "Our family has stayed in this house many times over the years and we thoroughly enjoy each and every visit. The house is well-maintained and freshly appointed. Very comfortable for our family of 6. Love the location at the south end of town, quiet area and convenient beach access with an easy walk to the downtown area." "We had a great experience at this house. Very close walk to the beach. Quiet street. " "This place was great. So close to the beach, very clean, and looked to be recently remodeled. We stayed for 6 nights with our 3 kids (ages 4 and under), and it worked out well. " "My family and I had a great time at this house. It's only a block from the beach, clean and well-maintained. There's not a lot of space in the entry-way to remove sandy shoes, but otherwise the house worked out well during our stay. " "The house was clean and newly remodeled or newly built. " "This was a perfect property for a family of four ( mum, dad, 2 young children) and 2 grandparents. A lovely, clean, well equipped property very close to the beach. We loved it! We booked at the last minute - the day before! Everything was handled so quickly and easily, there was no stress at all." "We loved the location of this house. Close to the beach and close to a great coffee/bakery. I would ask for this house to have a better place to clean your feet off from the beach and have more items to sit on at the beach. The house is cozy, has every thing in the kitchen (needs to updated spices) and we loved sleeping in the garage. One thing we didn't like is the house is off the main road so you couldn't sleep with your windows open. Other then that we would love to stay in this house again. " "Love this house for its location set up, and cleanliness. It is super easy to check in and out for the rental and great spot for our family. The stairs can be a bit tricky (we had a 1 year old this time) but there is a great handrail for the older kids. I would definitely recommend this house!" "Very comfortable beds but a bit noisy for sleeping due to bedrooms alongside busier road (Hemlock). House faces onto quiet road (Nelchena). Kitchen is very well stocked, everything you could possibly need. Great having wifi and laundry. Location is great because you are so close to the beach (20 min. walk to Haystack Rock) and easy access to Hwy. 101"
"Nice clean rental property. Short walk to the beach. Had a problem with the floor drain in the shower, called the office and they took care of the problem immediately. We had a 2yr. old with us, glad we brought a gate for the stairway. Beds were very comfortable. overall a very enjoyable experience." "We were very pleased with our stay. House clean, nice place fit our needs perfectly. The grill on the weber BBQ was rusted and we could not use but plenty of other options to use in the kitchen. Short walk to beach. Mo's for dinner very close. Good time...."
"This house is gorgeous, updated and feels very new. The layout is a little unconventional, however the location of being steps from the beach makes up for it. I would say - if we had any complaint (and it's a small one) - the house should come with a warning to families with small children. The stairs leading to the lower level are very steep ...with a very modern and cool rope barrier instead of a banister. Creates a great open feel...but also a few dozen heart attacks for my husband and I with our 2 year old. Parents be aware - this house is less than babyproof - but if you know that and can bring a baby gate or two, things would be just fine.. "
"This is a great house and only a block off the beach! Easy walk down to the beach and a small view from the upstairs window. Everything is fresh and new in the house. My family of 5 stayed there for 5 days and there was plenty of room and we loved it. " "Excellent, very clean well equiped kitchen, one block from beach." "nice location with good space and layout. CBPM is a pleasure to deal with." "This home was perfect for our family! We were able to walk to and from the beach several times each day. The property is equipped with the best of everything, from a Bose sound system to a kitchen with every appliance imaginable, all new or very well maintained. We will be back!" 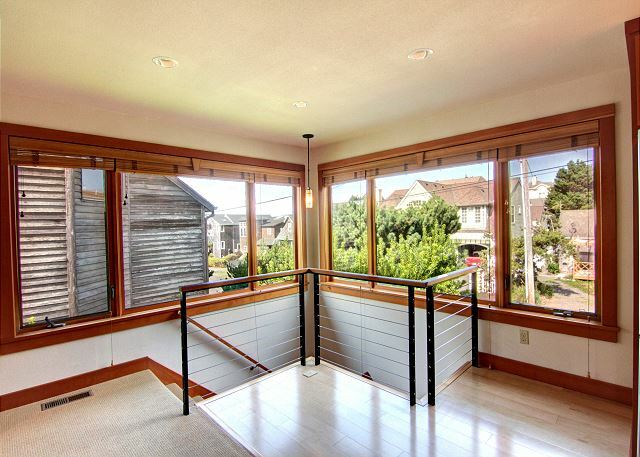 "This house is easy to get to, close to the beach, and beautifully maintained inside and out. The kitchen was stocked with every possible small appliance we could have imagined! The only down side was the lack of dresser or luggage stand in the main bedroom. We had to leave our bags on the floor, which isn't the kindest on aging backs. But that did not deter from the fabulous vacation we had at Cannon Beach." "This is the second time we've stayed at this property. It is up to date, clean and well laid out...especially the kitchen and living area. We were a group of 6 this time, two couples with one child each, and it was very comfortable. My only complaint is that it would be nice to have a gas barbecue instead of a charcoal one. A bigger deck would be nice too." "Spent a week with grandparents and family of 4. Great set up with 2 double beds in a converted garage - kids 10 & 7 yrs old loved having their own room. All the comforts and amenities of home. Having laundry facilities was really great. We had fires on the beach every night so it was helpful that we brought our own wagon to carry wood and s'mores ingredients the 1 block to the beach. Be aware the BBQ is not gas but a nice briquet Weber. Takes a little more work and a bit more difficult to regulate heat but great to have on site. No yard space but who cares when the beach is so close. About a 1/2 hr walk on the beach to town center. Make sure to eat at the Ecola seafood deli and stock up on groceries in Seaside as there is no big grocery store in CB itself." "The Koblegarde home was fantastic! It is conveniently located just outside the main part of town, which is nice to have a little distance from the hustle and bustle of the many tourists. The house itself was wonderful and beautifully maintained. The layout of the house is very creative and accommodates a large group of people. I really enjoyed the updated appliances and how clean everything was. It was very easy to feel at home in this house. Also the walk to the beach is very short, which is always a plus. My family and I really enjoyed staying at the Koblegarde house and would gladly go back anytime. " "We were very happy with the location of the vacation home. The sleeping arrangements were great and we felt at home. Stairs could be a possible problem." "We enjoyed our stay. Everything was clean and the house had everything we needed." "Great house for a girl's weekend. Perfect set-up with bedrooms and bathrooms, enjoyed the fireplace in the living area and the beach proximity was great! Kitchen was well-stocked with everything and the entire house was spotless (looks like every bit of it was recently updated). Loved it! " "Loved the house but need to replace the coffee maker with something that works better"
"Carpets could use a good cleaning. Other than that I was very pleased with my stay. The property management folks are extremely helpful and easy to work with. " "Great location. Modern house, yet cozy and quaint! Highly recommend for family, or friends. Each area/rooms private." "Our family stayed 5 nights and thoroughly enjoyed Koblegard House. It was very clean and well kept. Easy walk to beach and local bakery, coffee house and general store. Only reason for 4/5 stars for location was due to no direct view of ocean from house, but a minor issue. " "This is a perfectly located home - and would be perfect for 5 adults, or 2 adults and 3 - 4 kids. The upstairs is the heart of the home, and that's where the one queen bed is located. Both other bedrooms are downstairs. It's an interesting layout, but it works. The kitchen is well-stocked, and everything is very comfortable. Tolovana is also a wonderful area, with everything you might need in terms of coffee, seafood, beer, a small grocery, and great beach time." "Had a great time. Only suggestion is needed more paper towels and should have more soap and offer shampoo. A suggestion of dinner and lunch locations would also be good. All in all. Had a great time and would go back again. " "Last year we spent our annual surf vacay at a different house. It was ok, but we all agreed that Koblegarde offered a better set up for social interaction (this was the fourth time we rented Koblegarde). This year we spent a week in Cannon instead of the usual 3 nights. We got to know the neighbours who were extremely friendly and even got to share July 4th fireworks with them. The only thing we weren't prepared for was that because we stayed longer we went through supplies like dishwashing detergent really quickly, and due to the timing with the stat holiday, we ended up having to purchase extra on our own. In retrospect we should have asked the office earlier for more." "My family, 4 adults and 2 small children, stayed for a week at this great house. It was a perfect block walk to the beach. There is however no view to the beach, but we honestly didn't mind! I would definitely recommend to other families. The kitchen is perfect for cooking and having more people around the table. Enjoy your stay!" "We were extremely happy with this property. Located only a couple of minutes from the beach on a pretty road. The house was in immaculate condition with the bathrooms and the kitchen fitted with all the essentials and more. I can't think of any negatives to this beach house, it was perfect." "Home is a short walk to the beach. It was super clean and neat. The kitchen was a foodies dream. 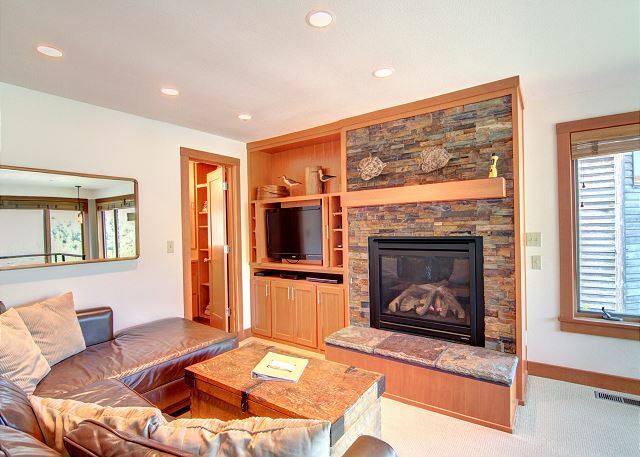 The furnishing and finishes of the remodel were done quite well. However, the "converted garage" was fair, disappointed that the garage door and opener still in place and functional, not finished drywall. " "What a wonderfully appointed home! Perfect for our family of 5. The amenities (kitchen products, bedding) were so luxurious and appreciated. It was exceedingly clean. We had a great vacation and would absolutely return!" "What can i say, the place was awesome!" "The appliances and ammenities all seemed new and were very nice. The layout of the house eg. the entry way was way too small, the showers were too small, very little closet space." "We found this rental property to be satisfactory save for the upstairs television which did not work properly. Fortunately, the repairman was able to switch out the cable box before football started on Saturday and we were back in business. Thanks!" "We've been to CB many times always enjoy our stays. This property was very comfortable and made us feel like home with a twist. We enjoyed our walks on the beach, plus having excellent meals at couple restaurants. Exploring new places. Find renting the house over one of the hotels made for a more comfortable time away from home." "A well apportioned gourmet kitchen, ample room for 6 adults and a one block walk to the beach make this a great vacation rental for a multi-generation family trip." "We rented four homes from CBPM and Koblegarde's and the others were all very clean and well furnished. It was nice to be so close to Haystack Rock. We hope to return in future years and highly recommend this and the other CBPM properties." "We had an amazing time. The property was so clean and full of great quality cooking equipment and appliances. Loved it and will come again!" "Pleasant, but for the weather, and you cannot always expect good weather at the beach. Upstairs bathroom could use brighter lighting. Upstairs bed not nearly as comfortable as downstairs one. Other than that, everything was in order and very nice." "A beautiful home. Was concerned about being on a corner -- but everything turned out just fine. Very quiet. Plan to rent again. A very nice short walk to the beach. The home had lots of light, well equipped Kitchen." "My daughter and I had a wonderful weekend at Cannon Beach. A lot of that had to do with the wonderful accomodations of rental #51. Since we both have "clean issues", this rental met all our expectations. I loved how the kitchen had almost every item one needed for cooking and baking. It was so nice to be able to just take a very short walk down to the beach. We would definately rent this unit again. Note to Trish in the office: Thank you so much for changing us from our initial reservation to unit #51. There was quit a difference in accomodations. You were very friendly and really wanted our stay to met our expectations. Thank you again; as your customer service attitude was appreciated. Jeanette." "We had such a great time at Koblegarde's, the house is even better in person than the pictures show (and I thought the pics were great)! It has been recently remodeled and they spared no expense, everything they have put in is very high-end and we were very impressed! The layout was perfect for us, after many great days at the beach or on hikes, the kids could retreat to their own place downstairs and we could relax and enjoy a quiet glass of wine upstairs by the fireplace. The two bedrooms downstairs are large and each has their own tv. The converted garage bedroom was great for two teen boys, they brought their xbox and were in heaven with the large flat screen, they felt like they had their own man cave! The upstairs bedroom is smaller but perfect for us, if you leave the window cracked at night you can hear the ocean. Location is great, easy walk to the bakery and store. We usually took the back roads just because it was a little more peaceful and fun to look at all the houses along the way. We usually stay right in town but have decided we really like the Tolovana area, it's so much quieter. The beach access is between the Ocean Lodge and Stephanie Inn straight down the street from the house (very close). This was the first time we have used CB Prop Mgmt and will only use them from now on! We have rented many houses before in CB and have never had one so clean and so perfectly matched for our vacation. Also, the Warren House Pub just down the street is wonderful, try the reuben!" "A group of 8 of us stayed at Koblegarde last year and loved it so much, we booked it again, however we found out that they were to do renos. We were SOOOO surprised at how amazing the place looked. The new amenities were state of the art, and we enjoyed the new comforts. We'll be booking here again next year!" "Koblegarde's Beach House is recently renovated and very well appointed. We were only a party of three but this house could comfortably accommodate 3 couples or a large family. Every conceivable item we needed was there and the only problem we had was a bit of trouble getting the televisions to work. The location is close to the beach and there is a little traffic due to being located near Hemlock. Just a short stroll to the market, bakery and pub too!" "This home is comfortable and located close to the beach but away from the busiest part of town. We loved the recent remodel. The kitchen is well equipped." impressed at how well it was stocked. We will stay here again." "The house was awesome, the location spectacular. We had a blast. There was everything provided for a wonderful family get together. Truly worry free. Thank you so much!" so nice to play on pristine sand"
"My husband, 2 kids & I recently stayed here for 3 nights. The property had just been remodeled & was very pleasing to the eye, well appointed & only 1/2 a block to the beach. Employees at Cannon Beach Property Mgmt were very pleasant & helpful. We loved it!" "Location, location, location! Great spot, especially for easy access to the beach. Home is well-loved and worn, but perfect for a beach cottage. On the corner of Hemlock (very busy street); not too noisy, but be mindful of pets and children getting too close." "This was a great house with great beach access. We did miss having an ocean view and hearing the ocean from the house. We will be back!" "We loved the amount of room this house had to offer for the price! Nice location with easy access to the beach. We would have loved this house to have a "Beach" feel with some nautical decor." "Stayed here in May; the location was just fabulous with a short walk to the beach. Older furniture is predictable in a dog friendly place; since I needed to have my dog, that was just fine with me! The garage is a little teen/older kid palace space of their own, which made the two family stay great. Would stay there again." "The house is looking worn/well loved, but was comfortable and met our needs." "It was the Thursday before Valentine's weekend We were freed from our obligations fot the weekend and decided to go to the coast. I was searching the internet and decided to just pick up the phone and call Canon Beach Properties, a company we'd used before for rentals. I asked if they had anything available that would sleep 4 and was pet friendly. Within seconds she pulled up her available units. Koblegarde's was and it was reasonable too! Kitchen was stocked well. There were towels for the dog. There isn't a yard, but the beach was so close it didn't matter! It's within walking distance to a small store and a nice place for breakfast. It's a drive to town, about 2 miles, but well worth it. This is a very dog friendly place! 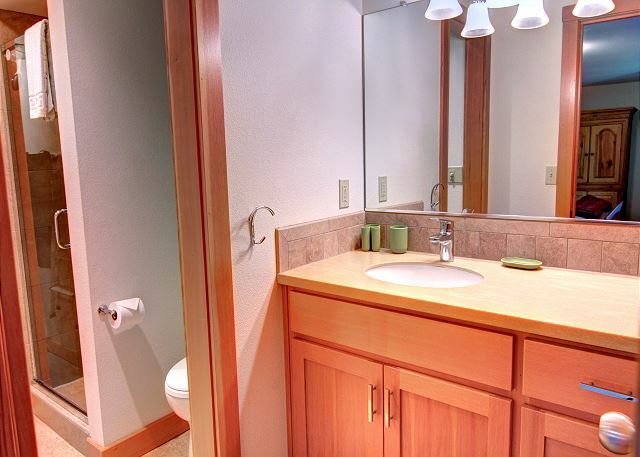 Highly recommend Cannon Beach Properties, and Cannon Beach! " "Our stay at the Kobelgarde house was very comfortable. We would recommend it as a nice place to stay. " "A friend and I planned a sewing weekend. It was very easy to set up 2 sewing stations, an ironing station and a cutting station. We'd definitely come back." "This is an affordable great place to stay at... just one block from the beach!" "The house was in very good condition, everything we needed was there and it was just a block to the beach. There was also a shuttle bus stop nearby to get to town, that saved driving and parking hassles. The only thing I'd ask for would be heat in the garage with the bunk beds, the kids liked that room but it was chilly." "For the reasonable cost, this place is great! Neat, nice layout, great location. " Koblegarde's property and we were very pleased with our accommodations and the open floor plan of the house." "This property was one of the best values we found and will suit a family who doesn't expect everything to be new and immaculate. There was a bit of a smell, one toilet became clogged for the duration, and carpet was worn, but the place was cleaned well before our arrival and was adequately appointed. The large downstairs bedroom and converted garage bunkroom are great for kids/big families and the place could hold a large group. There is no yard to speak of. It is a long block from the beach and had a very weak internet signal from a neighboring hotel. We like the Tolovana Park area (just south of Cannon Beach proper) with its less crowded beaches and some businesses/convenience store within walking distance." "the houses location was close enough to haystack that it was just a short walk. but far enough away so that our area of the beach was not over crowded at all... it made for a very relaxing weekend..."
"This house has 2 bedrooms plus a converted single garage (within the house) with a bunk and futon where our teens stayed. It is just a block to the beach about 1/2 mile south of Haystack Rock. Beach access is easy with just 10 steps. The house is very well equipped. The only downside is it is on the main road, Hemlock, so there is quite a bit of road noise. The location is not stated in the promotional material, so we didn't realize it bordered Hemlock until we arrived. We always enjoy Cannon Beach and have booked through CBPM several times before and are always pleased."